I have always been fascinated by typography so when the incredible Joanne Sharpe announced her online class,LETTER LOVE 101, I was one of the 1st to sign up. Now that the class has come to the end I can say it was one of the most informational and fun classes.I can also say that I really have had the opportunity to work with, in my humble opinion, one of the Helmar adhesives that doesn't get showcased as much as it should! Here is a link to a great chart explaining the different qualities and also videos demoing this product. HELMAR Professional ACID FREE Glue, with a neutral pH, dries clear and creates a FLEXIBLE bond. This is not the 1st time that I have used this PAPER to PAPER adhesive, designed for book binding, but it is the 1st time that I had the opportunity to use it on heavy 130 lb.watercolor paper and also used to adhere manilla tags to 130 lb.watercolor paper. I highly suggest all mixed media artists consider using this in art journals along with all other paper arts. Let me show you several different ways that I used the Professional ACID FREE GLUE in my journals created for the Letter Love 101 class. This is the cover of a handmade journal I made to hold several final projects. I used Strathmore 400 Series Watercolor Paper, 130 lb. weight, to create the handpainted pages. After putting it together I wanted to label the front cover. This is some heavy paper and this would be the test to see if this adhesive worked as well as it had on regular weight cardstock. The trick I discovered is to help the process along with a brayer and allow to sit overnight. That is where the magic happens...the bond becomes complete and you have what looks like 1 paper instead of 2 papers. Another fact that I've discovered is that it doesn't allow colors to bleed together...that in itself is a major selling point! I wish you could see it close-up, since I have a torn edge you can't really get the idea of the bond...it doesn't lift or curl. Here is another example that I created so you could get a look at different weights of papers using this adhesive. This book I'm working in is the Strathmore Visual Journal/Mixed Media and the papers are 90 lb. weight. I've learned that sometimes it is better to glue 2 pages together to create strength so that is how I started off. I know it is hard to see but the painted pages are not the least bit wrinkled, in fact you would never know that they are 2 pages thick. I wanted to try a different weight so I adhered a manilla tag created using the new stamps from DYLUSIONS, designed by Dyan Reaveley for Ranger Ink & Stampers Anonymous. The tag alone consists of 3 different layers so with my adhesive I applied a thin coat, attached the tag and smoothed it with my brayer. Here are the journal pages still in process but you will see again how incredible this adhesive works. No lifting away or curling of the edges! Here is another set of pages were I attached 130 ib. watercolor paper to the 90 lb. paper in this book. I'm going to sound like a broken record but HELMAR Professional ACID FREE Glue needs to be in your glue arsenal. I highly recommend it! I want to give a HUGE shout out to FABER-CASTELL, USA, a Preferred Partner for the absolutely phenomenal Pitt Artist Pen & Big Brush series. All hand journaling was done with these india ink pens in various sizes. It has become my pen of choice for art journals! Thanks for stopping by. If you have any questions I would be more than glad to answer them. It is time to GET YOU GLUE ON!!! It's Grace here and though I am still wrapping up all the "homework" I have from CHA I have been having some creative fun this past week. Moving into spring and starting to gear up for Easter how about you? Us crafty types start early... got to leave time to make those fantastic projects, right? Today I bring you a very large, yet simple and sweet, wall art project. I used Helmar Acid Free Glue and spreader to adhere the brown packing paper on the back side and wrap it around the sides of the foam board (what ever shape you desire to cut it into). Then using Helmar Acid Free Glue and spreader I adhered book pages to the front of the board. When doing this only glue the tops of pages down so the bottoms are free to curl and crinkle and add movement to the piece. Here was my favorite part... moss is messy but I found this Super Moss Mat (a flat roll) at my local craft store and when you use Helmar 450 with it... OH MY GOODNESS, it was SO EASY AND FAST! While the back and book pages are drying start adding the Super Moss Mat to the letters. Adhere the Moss Mat to the front of the letters (very important you do this to the front... hehe) with Helmar 450 Quick Dry. Then cut around the letters and on the 3D letters leave 1/2" (or however deep your letters are) boarder around the letter to allow wrapping over the edges. Here is a close up. You can see the "N" is one of the 3D letters and the "E" and "S" are chipboard and are flat. Look at those crisp lines the Moss Mat Makes! I just love how easy and (not SO messy) it was to do this. I then used Helmar 450 Quick dry to adhere the letters to the board and the grommets into two holes at the top. I added the bowed ribbon and knotted it on the front. I actually went through and curled all the page corners forward to give it some playfulness and then I was done. I hope you have enjoyed this post. Please feel free to let me know your thoughts in the comments below or if you are working on any spring projects I would love to see them. Helmar Glue is Child's play! You will also need 4 cups cut out of an egg carton (the part the egg sits in) if making two birds. We started out by glueing two cups together with some Helmar 450 Quick Dry. We then cut strips of plaster bandage to cover the egg carton to create the body. You could use some of the Helmar Craft and Hobby PVA to make paper mache but in working with a 2 yr old, I wanted to make the drying process a little quicker. Once it was dry we then gave them a coat of Helmar Acrylic Sealer. I wanted to make sure that the paint wasn't going to come off when we did the next step and to add that little more strength to it. This product is non toxic as well so safe for him to use so I gave him the paint brush to do this as well. The Helmar fun didn't stop there... once dry (which didn't take long at all) we then used the Helmar Craft and Hobby PVA glue to stick the feathers onto the body. He had so much fun with this. He couldn't wait to do it too as we went out specially earlier that day to get some just for this project. Next I cut out the foam shapes for the eyes, hearts and beaks and added the arms and feet made from bending the pipe cleaners into shape before inserting them into some holes I made in the body. Austin then added the face pieces including especially the 'Goopily Eyes' which was his favourite with some Helmar 450 Quick dry. The last little step was to add Hootabelle's butterfly and decorate her heart a little more. Austin punched out the butterfly with a Martha Stewart 3 butterfly punch. We used the little one which we stuck on with a little more Helmar Craft and Hobby Glue. Lastly we had to add the dots onto the little heart decoration on her. These are the finished Owls. I hope this share inspires you to do something creative with a little one - maybe even this project! The first thing you need to do is cut the salvage off and score you bi-fold 4" from the bottom going horizontally. Then score 6" down the middle of both sections of the bi-fold. It should look like this. You are ready to get your Helmar Craft Glue out and glue the two middle sections together. It should look like this. You now have a four pocket porfolio. For the front, I used more of the beautiful pattern papers by Authentique. I used Helmar Professional Acid Free when glueing the mat down. The ribbon is by May Arts. As you can see in the photo, I covered a clip and used that to keep my portfolio closed. I hope you enjoyed this~next month am going to show you another idea I had for the bi-fold paper. Have a great day and thanks for stopping by and I will see you soon!!! ...a gem of a birthday girl! One of my good friends shares my love of coffee, pink, and bling...and well, she is a true GEM. This year, for her birthday, I wanted to dress up your 'run-of-the-mill" Starbucks card and so I decided to use some PREMIUM CRAFT GLUE and some Dew Drops from one of our awesome preferred partners, The Robin's Nest! I began by coloring up this cutie and then decorating a gift card tin (these are only $1 from Hobby Lobby and are usually fully stocked toward the front aisles around Christmas time!). ACID-FREE Glue totally does the trick for this. I then went around the edges with some Premium CRAFT Glue. Gemstone glue will also work exceptionally well for this but I wanted to showcase CRAFT GLUE because it's one of my favorite Helmar products! Thanks so much for stopping by today and I'll see you all soon! These last few weeks, I have been trying to encourage myself as an artist. Those that have creative minds might understand what I mean. As artists we may wake up thinking creatively and go to bed thinking the same way. I have been an artist since I was in junior high and it wasn't until just about three years ago that I realized that I was created this way. I mean, unless you have friends that are artists and like-minded, you feel alone and at times might question your sanity! There are times when we need to get our hands dirty with paint (and Helmar) or we feel restless. There are times where we might get discouraged or feel like we are not good enough. I continually fight the lies that are fed me that keep me from creating. 1. Keeping my priorities in check. When I put the things that are most important in my life first, it keeps my mind guilt free to create. For example, my family comes first. So, I keep myself accountable to making sure my other job (wife, mother, and homemaker) is done before I pull out the scrap supplies. So, I do my household chores first. To do that I have a weekly schedule breaking down my duties so that I do not get overwhelmed. This year I have realized the importance of relationships. When you are thinking of others, you aren't thinking about yourself as much. Know what I mean? The more you think about yourself, the more you are focused on your short comings and not on your gifts. Join a scrap club. Go to a retreat. Attend a weekly mom's or women's group. When you meet new people, you are able to bless them with yourself and your talent.They end up blessing you too! There has been two times in my life that I gave art up. I use to draw and paint and those gifts are almost gone now because I did. Some artistic talent is perfected by practice. When you give them up they can be lost. I regret those times in my life where I was lost in who I was and tried to be what others wanted me to be. I am so thankful my dear twin sister persuaded me to pick up a paint brush again. Never give up. You were created to create! If you tend to always have a desire to either paint, color, draw, cut, glue, or get your fingers dirty with a charcoal pencil, you are unique! Embrace that! Set a specific time in the week to create. I make sure all my week's duties are done by Saturday so that I have a free day to at least get in the craft room once on the weekend. Once a week sometimes isn't enough for me and my mind keeps busy creating even when I can not get into the studio to play. So, to help keep my mind at peace, I keep sketch books around the house. One is on my nightstand. When I have an idea for a project or layout, instead of tossing and turning all night wishing I was using Helmar's 450 Quick Dry, I grab my sketch book and jot it down really quick. You would be surprised how quickly you fall asleep afterwards! Sometimes this one is hard. But, take time to look at your work. After doing a page, I place it in my album and sometimes it just sits there. Take it out. Show your children. Let your family enjoy your work. When they express their joy at the memories you are recording, it gives you joy. If you are a card maker, keep a few of your pieces. Color a few images just for yourself. Frame and hang them up. Enjoy them. Layout supplies: Helmar Premium Craft Glue, Helmar's Scrap Dots, and Bella Blvd. Helmar Adhesives pass the TEST! I can unequivocally say that HELMAR Adhesives do exactly what they say they are going to do. I traveled with 7 projects in a carry on, 4 different flights, coast to coast, 5400 miles total, to attend Winter 2012 CHA. Upon arrival I had to check the condition of the projects...I spent several sleepless nights debating how I was going to safely get these projects where they needed to be. I can attest that Helmar Adhesives receives 100% success rate...not one project needed to be repaired, not one embellishment lost, not one ribbon or trim needed to be re-applied! With that being said I would like to share 4 of the projects that made the trip and were displayed at CHA. In my signature round canvas I created an art journal background with several Tattered Angels Plain Jane products. I used several different materials ...manilla tags, chipboard, tape, canvas, brass embellishments & twine...finished off with Canvas Corp twine wrapped and glued along the outer edge. All of these embellishments were attached to the canvas using Helmar 450 Quick Dry Glue. I needed something strong, that would hold together many layers of materials with different weights. Another project was this fabulous 12"x12"photo album from Walnut Hollow, Tattered Angels Glimmer Mist colors from the Germany Clam pack, Tim Holtz Grungeboard alphabets and several found objects.Helmar Adhesives used included 450 Quick Dry Adhesive & Premium Craft Glue. The last 2 projects are canvases that were created for the Tattered Angels Winter Catalog...again only Helmar Glues were used for this task. Both utilized Helmar 450 Quick Dry Adhesive. I know it seems like 450 Quick Adhesive is the only glue that I use, many times it is but I have found another "go to" Helmar Adhesive that I'm going to share in my next blog post on Feb. 29th. Everytime I use this adhesive I am amazed at how well it works so stop back see which adhesive it is. Thanks for stopping by and it's time TO GET MY GLUE ON! Hi there! Hope you are having a great week! It's Carolyn and I am back with another canvas today. Remember my new year's resolution to try new things? Well....I am doing pretty well with it---I try to create something a little bit different from my norm at least once a month. Doesn't sound like a lot but when you are sweating out every last detail because you are in unfamiliar waters---It is! Today I have a canvas to share that I created with lots of paints, patterned paper, Helmar Decoupage and Craft Paste and Helmar 450 Quick Dry. I painted the canvas with butter creme acrylic paint and I added some light blue paint along the edges and on the sides of the canvas. After the paint was dry, I went to my patterned paper scrap drawer and pulled a few pieces out. I cut different ones in a square shape and I added them to the canvas in just a few areas using the Helmar Decoupage paste. I also coated the top of the papers. After letting that dry I went back to the paints, adding some more buttercreme paint along the edges and across the papers I added. I mixed in some brown and some yellow paints and just added paint where I felt it needed some. I used some bubble wrap to "stamp" some blue distress ink onto the canvas. 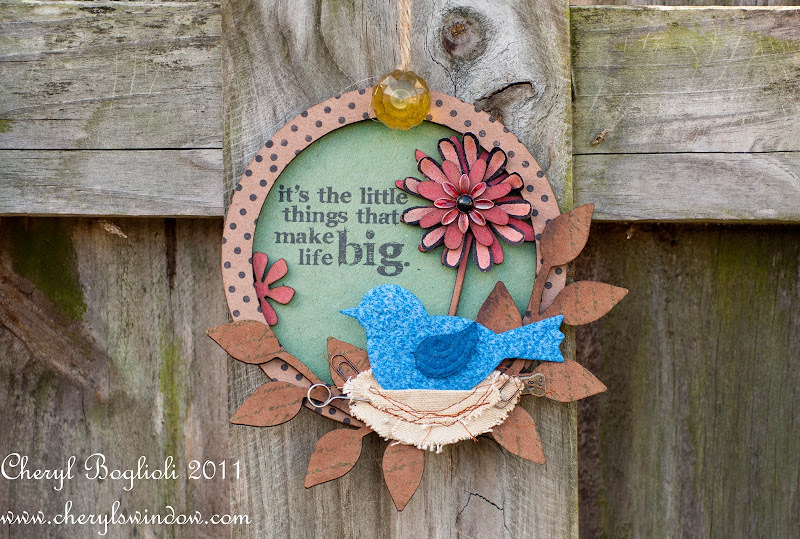 Then, I printed off the sentiment and butterfly from my Silhouette machine (both are by Lori Whitlock). I adhered the sentiment with Helmar Decoupage Paste and added some rub ons on the canvas. After coating the top of the sentiment with Decoupage Paste I let the canvas dry a bit more. Next, I added some highlights and shadows with a charcoal pencil, rubbing it in with my finger. I added some pearls to the two butterflies in the air and then added the cut out butterfly with some Helmar 450 Quick Dry. Hope you enjoyed my canvas. It is hanging in my office as a reminder for me to "Find Joy Every Day." Hope you are trying new things---and taking Helmar with you! I've never been a Mini Album kinda girl. Always thought I didn't have what it took to create them. My brain started working overtime and the ideas started flooding in when I received a few beautiful ones from Basically Bare. Hey there everyone, Erika Taylor here to share with you an album filled with my love for my husband. I wanted to create something that would keep some of my wedding memories alive, so I went into uber romance mode and this album was the end result. This book was perfect to hold some of the items that I kept from our Vegas wedding. So here we go....An album all created with a little love from Helmar and Authentique Papers. First off, filled with the Authentique Papers Collection Uncommon, lace, rhinestones and distress ink. Followed by the pages of the book in order for you to see. For the next page, I used a piece of photo wedding negative for the pull. I adhere it together with Helmar 450 Quick Dry and it worked amazingly well!!! Our Wedding Vows, plane tickets and our first wedding card from my Father. We'll take a gamble and say "I do"
That make life Big - even my love for glues (and not sniffing them) and various forms of art! I have a new passion for what is referred to as assemblage art; I love taking bits and pieces of things and creating a work of art out of it. This was a project I made for Tattered Angels Winter 2012 catalog featuring the Plain Jane collection and I’m just getting around to sharing it here. I used Wendy Vecchi Art Parts as well as some grungepaper and various other elements. I think my favorite elements of this design were the Basically Bare Elements. The nest was made with canvas leaves from their Blossoms and Leaves package layered and sewn randomly together. I left the string ends loose to give to the nest appearance. 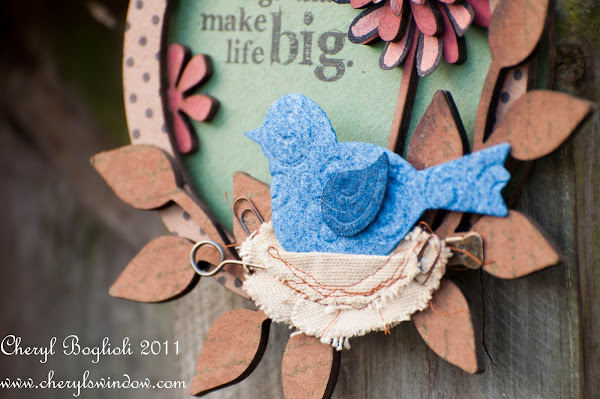 The bird was fun because it is a Basically Bare felt bird that was embossed with embossing folders and then misted. Now the best part of this art is the assemblage part of it. All of the pieces were assembled using Helmar Acid Free Glue and Helmar Gemstone Glue. Since art parts are similar to a form of compressed papers, I find that the Helmar Acid Free Glue makes a wonderfully strong adhesive, especially since it has been designed specifically for book binding. Even the back of the bottle reads, “Featuring excellent adhesion to dense papers and highly flexible bond. Sets clear, dries quickly, and will not yellow with age.” Doesn’t it sound like just the perfect glue for these art parts? I used the Helmar Gemstone Glue to glue the flower center and to adhere the little metal parts in the nest so that I could guarantee these would not move and fall out. I love that Helmar Gemstone Glue also dries clear. I even used it to glue the belly of my birdie in his nest; don’t want my bird to fall out of the nest. I will proudly say that I love my Helmar adhesives. I appreciate that they have a variety of adhesives to work with whatever medium I am currently working with, especially since I like to create all sorts of art and mixed media. Is there a Helmar adhesive that you haven’t tried yet or are not sure how best to use it?